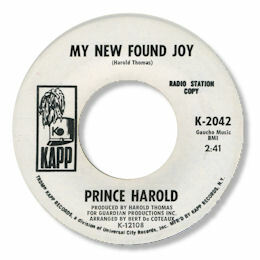 Prince Harold was the alter ego of New York record man Harold Thomas. He used it for the occasional recording that he did in the 60s but his primary musical role was a back stage one - writing, producing, A & R work etc. But that is not to say that he was an amateur singer. Far from it. Amongst his handful of sides were a couple of fine performances and one very good one. Most of his output was in the big city vein with the melodic Why'd You Go Away and "Forget About Me" being the best cry ballads. The former just takes the honours thanks to Prince's more impassioned delivery. But better by far was his Kapp single. The tasteful toe tapper "They Don't Make Women Like You Anymore" is a classic piece of Big Apple uptown music but the real gem is on the flip. My New Found Joy is really fine ballad sung with some real fire, with an excellent Bert De Coteaux arrangement. Most deep fans will be aware of the screaming version by Jimmy Richards on A & M but in its "quiet storm" way this original cut packs almost as big a punch. 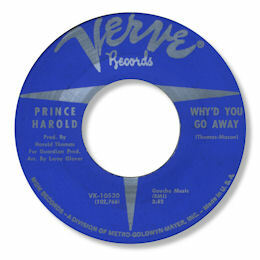 UPDATE ~ Both John Reed and Tony Rounce have written with new disocgraphical info on Prince Harold. John has mentioned the Chairman of The Board 45 and Tony has mentioned the Prince and Princess release. Both are now in the discography. I'm grateful to both correspondents. Thanks to Johnny Spencer for the correct date for the initial Mercury 45. 1. There are acetates of another Prince Harold disc - "I Got It" and "Honey My Love For You" which are both duets with Little Eva. Neither side appears to have been issued. 2. "Ain't it amazing" can be found on the Ace UK CD "The Soul Of Spring Vol 2 ".